I think a knowledge of our country and our world geography is very important for everyone to know. We don't spend a lot of time studying geography we usually add it into our other studies or books we are reading. My girls have little sticky paper dolls that they move around our world and USA wall maps when people we know are traveling. They have them text or call every time they stop or enter a new state. If no one we know is traveling they will move the dolls to places we are reading or studying about. 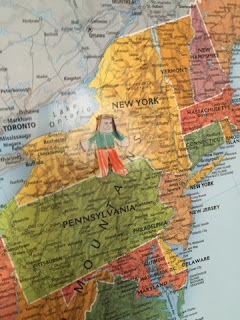 We just recently started using Drawing Around the World: USA from Brookdale House, it has been a fun addition to our school and Alaina's paper doll is moved to the state she is learning each time. Drawing Around the World: USA is available as a printed book or an eBook, we received the eBook to download. It is designed to teach children to draw sections of the USA from memory. This 282 page eBook teaches new states each week. It is recommended to use this four days a week completing the book in twenty-seven weeks. Not only does it teach the states and their shapes the student also learns interesting facts about each one. They have a fact table to document capital, populations, area, and more. Blank maps and colorful maps with labels are provided, and the only additional resource you may want to use is an atlas, you may use a book or links are provided in the eBook for an online access to one. There is also additional memorization techniques to help your child memorize the states, and timed activities if you children are up for the challenge. I had all three of my girls use this eBook, but the primary focus has been with Alaina. The other girls know all the states & capitals name and locations, they just get some of the smaller states on the east coast confused when labeling a blank map. We only spent about 5-10 minutes per day on this, but it could get a little longer as Alaina adds more states to draw. On the first day of the week the new state is studied and the State Fact Table is filled in. The student locates and labels the new state and then fills in the previously learned states. The second and third day Alaina located and labeled the new states on the black and white map and then drew all the states she had already learned. Day four she listed the states she has learned by memory. I had Alaina use this four days per week. Amber and Delaney just worked on the New England states so they could remember their shape and location. This is a geography course with drawing activities not a drawing curriculum. The girls don't draw each state exactly as they are, but they can draw the shape close enough to recognize what it is. 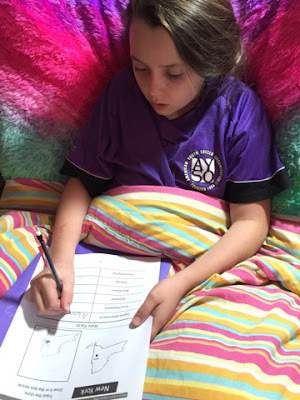 After drawing the states Alaina would look at them and find something about their shape to help her remember what it looks like. She would recall those shapes every time she drew that state. Alaina is having a lot of fun using Drawing Around the World: USA and it is really helping her with mapping the USA. We will definitely be looking into Drawing Around the World: Europe when we are finished with this one. Social Media Twitter Facebook Pinterest Google+ Members of the Schoolhouse ReviewCrew were offered several titles from Brookdale House. Some used different time periods of Writing through History, Grammar, Sheldon's Primary Language Lessons and Spanish. Be sure and check out those reviews by visiting the Crew Blog.